At Overland Park Dentistry, we’ve got your teeth in mind all of the time. With summer starting and the kids home from school, you might be looking for some tooth-healthy options for snacking. Lucky for you, our team of dental experts but together a list of the top tooth-friendly snacks for summertime. Before you start munching on a snack, ask yourself if it’s loaded with sugar. If it is, think again. Sugar reacts with bacteria to produce acids. Brown sugar, honey, molasses, and syrups react just like traditional white sugar, so keeping sweets to a minimum is better for your teeth. The damaging acids affect your teeth for at least 20 minutes after eating sugary snacks. Sticky, sugary snacks are the worst – think caramel, taffy, etc. – as the sugar sticks to your teeth longer, giving it more time to cause damage. If you eat sweets, it’s better to eat them as dessert rather than several times a day between meals. Also, it’s a good idea to brush with a fluoride toothpaste after eating them. 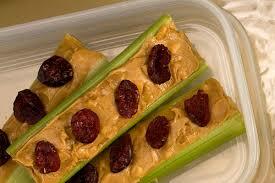 Peanut Butter Celery Sticks – Celery is so crisp and refreshing. Pop some peanut butter inside and you’ve got a teeth-healthy snack with a little protein to boot! Don’t be afraid to throw some raisins or cranberries on top. TIP: Remove the strings from the outer side of the celery to make it more kid friendly and easier to eat. 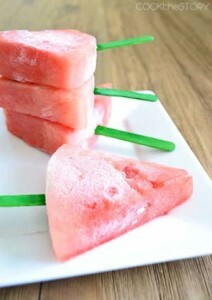 Watermelon Popsicles – So easy, you don’t even need a recipe – just slice, insert popsicle stick and freeze! Leave the rind on or cut it off – it’s up to you. It doesn’t get any easier, or any more refreshing. Peanut But ter & Banana Quesadillas – In just 10 minutes, you can whip up this crispy on the outside, ooey gooey on the inside summer treat. 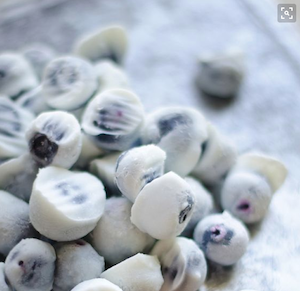 Frozen Blueberry Yogurt Bites – With just blueberries, nonfat vanilla Greek yogurt, and a sugar substitute, you have a sweet, frozen treat that’s good for your teeth!. Once these bites are frozen, you can portion them out into little cups to take on the go, or just grab them by the handful. If you’re introducing new snacks to your kids, it’s best to make them as convenient as possible. In other words, instead of telling them to get a celery stick with peanut butter, go ahead and make them up ahead of time and leave them front and center in the fridge so they are easy to grab and go. Leave fresh fruit out in a bowl on the counter in plain sight. Chop some strawberries and put them in a bowl to make adding them to yogurt a cinch. Since you’re making the better snacks available, stop buying the sugary ones so they don’t default to their old ways. The whole team at Overland Park Dentistry wishes you a safe and savory summer! Please call us at (913) 647-8700 or (913) 341-2380 if you have questions about your teeth or your children’s teeth. Find more great teeth tips on our blog.